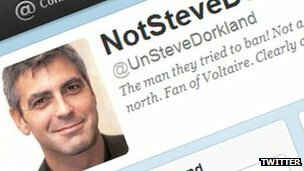 The man behind a Twitter account spoofing the chief executive of a newspaper group has been accused of hacking into an email account. Northcliffe Media, owned by the Daily Mail, has taken legal action to make Twitter reveal the man's identity. In court documents, the company accused "@UnSteveDorkland" of making staff "fear for their safety". The account holder told the BBC he denied "all accusations of illegal conduct set out in this document". Twitter has said it will comply with a court order and reveal the user's details on 1 August. However, the BBC understands, the account holder will be challenging the decision with the help of a pro-bono lawyer, whose services are provided free of charge "for the public good", in the US. The account holder is also being advised by internet rights groups. If the court order, which has been posted on the Guido Fawkes blog, is quashed, lengthy court proceedings could result. Court documents filed at the beginning of the month accused the account holder of being "the creator and/or maintainer of at least three particular accounts", which impersonated - to varying degrees - Steve Auckland, Northcliffe's chief executive. "At least some of the information made public on Twitter by the defendant was not known publicly," the court papers said. "And on information and belief, the only way that such information could be obtained was by hacking into an email account at the plaintiff's [Northcliffe] business." It also accused the account owner of posting information "apparently obtained from surveillance of plaintiff's employees", as well as engaging in other fraudulent and defamatory activity. The account older told the BBC he denies all of the accusations outlined in the document. Northcliffe's Mr Auckland said in a statement: "I can confirm we have taken action to ask Twitter for help in identifying the individual in order to protect our staff from harassment. "We made no request for, nor had any input in, a decision to stop tweeting. Our first priority is a duty of care to all of our employees." Northcliffe is yet to make public the specific tweets at the centre of their accusations, although one source at the company told the BBC they were concerned about "homophobic" remarks. Speaking last week, the account holder denied making offensive comments on the social network. "People can make their own judgement," he told the BBC. "I've not taken anything down. It's all in the public domain, I've not touched them at all."